The staff did a good job at breaking the language barrier and was able to have effective communication. Excellent location. Had a twenty hour layover. We chose to stay in town rather than at the airport. We took the Airport shuttle bus #5 to get here. It took a while but dropped us us off a few minutes walk from the hotel entrance. The bus fare was cheap 24 RMB per person compared to 200 RMB via taxi. Lots of places to eat and main attractions are just a short taxi ride away. Had some very helpful people at the front desk. and at the concierge. Very kind with directions and taxi bookings. I liked the location, price, ease of getting to metro and the rooms were clean and bed was comfortable. I like the location! Very very good! Just in the center, the subway 1 min walk from the Hotel. I like the cosy and specious, clean room. Location. It is in the downtown then it is convenient for me to go around. Very clean and extremely comfortable. We got a very good night's sleep. Excellent location near Shanghai Railway Station and near many touristic attractions. One of our top picks in Shanghai.Ideally located opposite the Everbright Kerry Shopping Mall and surrounded by restaurants, Holiday Inn Downtown Shanghai is a 5-minute walk from Shanghai Railway Station and Subway Station (Line 1, 3 and 4). It features free Wi-Fi, a fitness center, 3 restaurants and 2 lounges. Rooms include satellite TV. 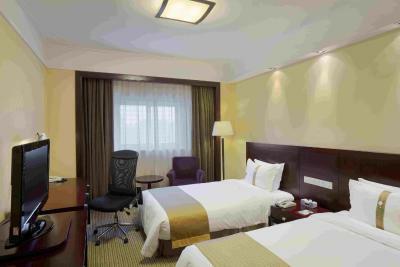 Holiday Inn Downtown Shanghai is a 10-minute drive from The Bund and Nanjing Road. 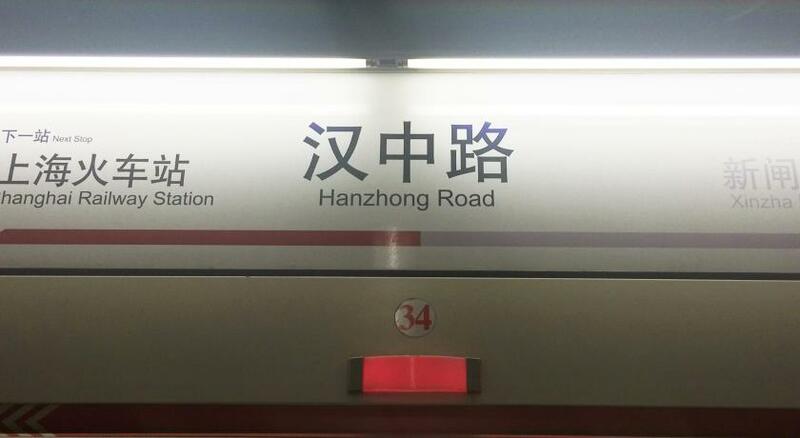 Hanzhong Road Metro Station (Line 1) is 11 minutes' walk from the property. It is a 20-minute drive from National (Shanghai) Center for Exhibition and Convention. It takes 20 minutes by car from the hotel to Hongqiao Airport and 45 minutes by car to Pudong Airport. 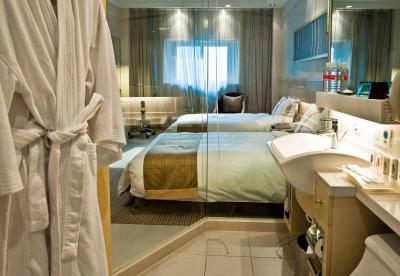 Each air-conditioned guestroom is equipped with a private bathroom and mini-bar. They also come with a desk, tea/coffee maker and ironing facilities. A bathrobe and hairdryer is provided. Guests can enjoy sauna facilities at the hotel’s spa. A business center provides various office services and internet access. An international buffet, seafood and barbecue steak is served at Angel’s Cafe. Yue Garden Restaurant features Shanghainese cuisine. Moon Bar serves bar snacks. 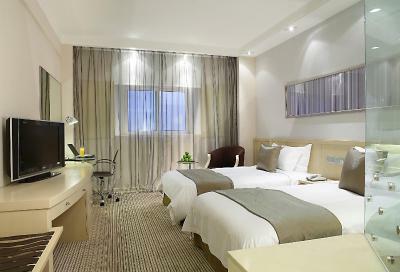 When would you like to stay at Holiday Inn Downtown Shanghai? 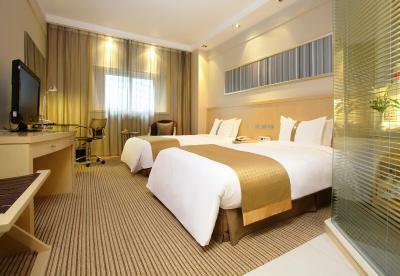 The air-conditioned room comes with LCD satellite TV, mini-bar, desk, safe and private bathroom. The air-conditioned room comes with satellite TV, mini-bar and private bathroom. It also features an iPod docking station. Air-conditioned room comes with satellite TV, mini-bar and private bathroom. It also features an iPod docking station. The suite features a separate seating area and free breakfast at the Executive Lounge. The room offers Executive Club Lounge access and benefits like free breakfast, snacks and happy hour drinks. This room has a living room, and it features a safe, a mini-bar and a working desk. House Rules Holiday Inn Downtown Shanghai takes special requests – add in the next step! Greatwall Peony Dragon Pacific Jin Holiday Inn Downtown Shanghai accepts these cards and reserves the right to temporarily hold an amount prior to arrival. Holiday Inn Downtown Shanghai accepts these cards and reserves the right to temporarily hold an amount prior to arrival. Air condition and refridge in the room are not cold. Location is good, easy to walk to shopping center and nice restaurants. The bidet in the room was not working and when we asked if it could be fixed at the Concierge, the answer was a plain no. This has been an issue with the bathroom for a while and no attempt has been made by Management to get this fixed for guests. This should be attended to or else the room should not be let out. The breakfast buffet was good with lots of variety to choose from. The double bed was comfortable. The toilet is not clean enough as the blower not work well. The A/C not cool. No any outstanding on the services while staying. As my check in is almost mid night and out early morning. The staff is well trained for recceiving and taking care of guest. The room was quite small for two people and two single beds. The location was not as good as "downtown" would suggest. Breakfast was good with varieties of Chinese and Western food. Service was also good. The room was clean and comfortable and the hotel staff courteous and helpful. Badly run-down hotel. Clutter behind the front-desk. Breakfast room without windows. Old exercise equipment. Location was good within walking distance of rail station. Everything was really nice but was disappointed when I pulled the shower curtain back to take a shower and saw hair in the tub from the people before me. The internet does not work. If it worked only 5 minutes a day. The stuff at the reteption almost did not speak English. I do not recommend that hotel if you are at the business trip. Location was Ok very closed to subway. The location was pretty good and a short walk away from the Subway. This was my second time to this hotel but I never feel it is a chain of Holiday inn. Staff even doesnt look professional. No person to collect the luggage.